When a tragedy happens and the family brings news of a long standing tradition, Ako realises that theirs really isn’t different from most marriages. Can they redeem themselves in “a marriage based on hatred and mutual embarrassment”…? Time: 3pm and 6pm each day. In the course of preparing for this play, the cast did a photo shoot to explore the various expressions of a troubled marriage. It was an emotional experience which they would love to share with audiences all over. People are encouraged to name each expression and give a befitting caption, using the hash tags #OHDIDT #SomeMarriageFaces and any others suitable. 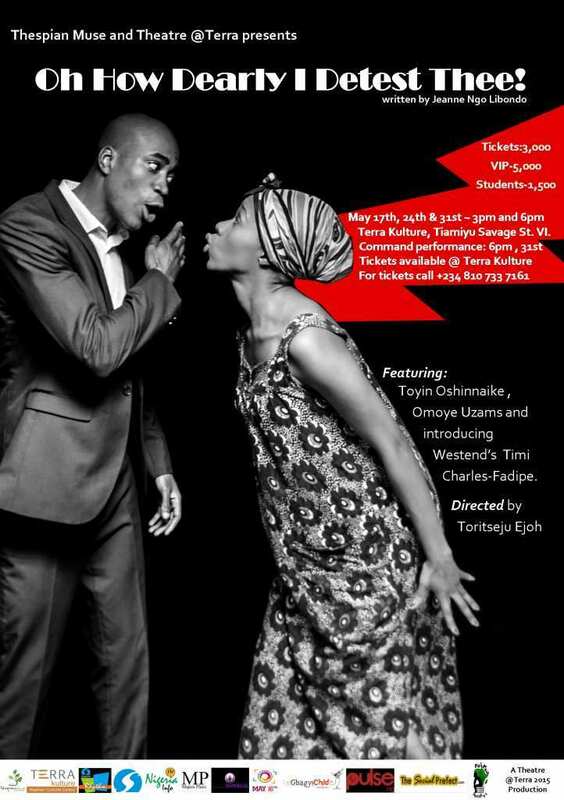 OH HOW DEARLY I DETEST THEE features Omoye Uzams and London/Westend actor, Timi Charles-Fadipe in his first performance in Nigeria alongside theatre veteran, Toyin Oshinnaike and Olarotimi Fakunle. The play is directed by Toritseju Ejoh and produced by Thespian Muse. This entry was posted in Acting, Arts, Event, Performance arts, Theatre and tagged africa, art, drama, Lagos, Nigeria, Oh How Dearly I Detest Thee, performance, Play, Terra Kulture, theatre, Thespian Muse by africanrenaissancetheatre. Bookmark the permalink.